Throughout my tenure as an English teacher, students have always seemed to struggle with the indefinite article and definite article. Teaching this topic can be unbelievably difficult. There are many rules to master, some with exceptions that are both confusing and bewildering. 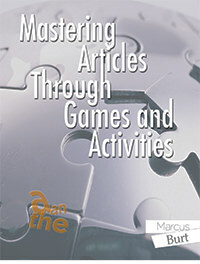 In response to this, I wrote a book entitled Mastering Articles through Games and Activities. My aim was to create a learning resource that would help educators make a dull, stressful topic fun, engaging, and action packed. All of the material on this website comes from the first part of my book and does not include the games or materials that follow them. Some of the activities covered on this website do not deal with the indefinite article and the definite article per se; e.g. pair nouns, aggregate nouns, irregular plurals, and generalizing in the plural. However, a lack of knowledge of these topics leads students to make mistakes using articles. Before you begin the exercises in this course, it is a good idea to do the pre-test so as to gauge your knowledge of articles. The vast majority of students do not pass this test; 80% or over is considered a pass. I have also added a blog section to this website where I take pictures of both the correct and incorrect use of the indefinite and definite article in the hope that these real world examples will give students a more personal understanding of this topic. I hope this website helps you in your quest to speak better English.